The Royal Shakespeare and Swan Theatres have recently reopened in Stratford-upon-Avon following a three and a half year multimillion pound transformation. As part of the celebrations they asked us to make six short animations. 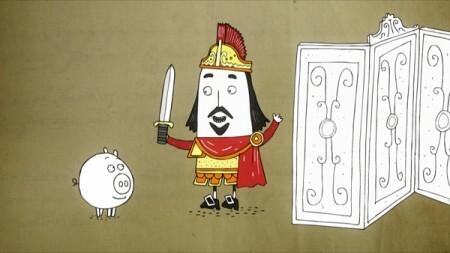 They’re entitled ‘Billy’ and they feature William Shakespeare and his pet pig Francis. In each animation Billy is searching for a crucial idea for his plays. The backgrounds for the films are photographs of genuine vintage paper and parchment from the Tudor era – provided by the Shakespeare Birthplace Trust. One of the books was the Stratford-upon-Avon council book, with thick paper made from rag (that was more hardwearing), with recurring mentions of John Shakespeare (William’s father who was on the council). Greg is an award winning illustrator, animator and director. Greg has a distinctive hand drawn style and has worked on a wide range of projects including animation, illustration, e… Show more. Send a message directly to Greg McLeod. Greg is an award winning illustrator, animator and director. Greg has a distinctive hand drawn style and has worked on a wide range of projects including animation, illustration, exhibitions and book covers.